Every summer when we switch to night turnout, my horses seem to go on swing shift. After their morning grain, they crash and burn, lying flat out in their stalls. They sleep during the day, so what do they do all night? I wanted to find out more about horse sleep patterns and sleep needs. Bless Google for helping me out with this question. Horses don't get nearly the amount of sleep that I thought they did. While they rest frequently, they spend only 1-4 hours of sleep a day. This is typical of prey animals who are vulnerable when they sleep. The average horse will rest drowsily for a few hours, sleep lightly for two hours, and sleep deeply for less than an hour. Over a period of 24 hours, a horse will be drowsy for about two hours, sleep lightly for two hours, and sleep deeply for less than an hour. But these are totals. Each day, the horse has several drowsy and sleep periods of only a few minutes each. The horse can sleep lying down but they can also sleep standing. The horse can sleep lying down if it so chooses, but lying down places stress on their internal organs. Most horse people know they can sleep standing up, but how? Horses have a "stay" apparatus in their front and hind legs that allow them to sleep standing up. The horse just relaxes his front legs to trigger the stay apparatus; in the hind leg, the rotation of the hips (the horse typically rests his weight on one hind leg) triggers the hammock-like locking mechanism. 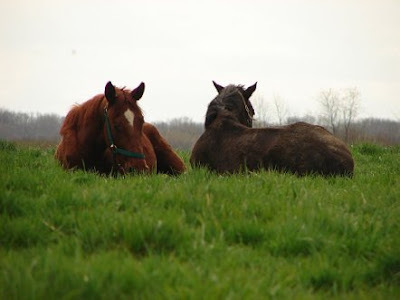 Studies of feral and domestic horses shows that horses take "power naps." In pastured situations, horses use the buddy system -- one horse keeps watch while others sleep -- to get the rest they need while keeping safe from predators. Stabled horses are isolated from their buddies, so they are not as comfortable sleeping in their stalls. Veterinarians who study horse sleep has observed that horses stabled next to each other rest standing against the two sides of their shared stall wall, probably to try to be near a buddy. While we think of our horses as "safe" in their stalls, horses may not sleep as well in a stall. Evidence suggests that pastured horses sleep more than stabled horses and they get more down time. Stabled horses usually sleep during the low activity times of the barn (evening and early morning hours). his/her ability to lie down physically. Is he in pain? Does he have trouble getting up? His environment. Is it always noisy? Hectic? Loud? Emotional issues. Too nervous to lie down? Afraid of not being able to rise? "While they rest frequently, they spend only 1-4 hours of sleep a day." I want some of the coffee they've been drinking! I've seen this with my 2 guys in the pasture may times. One lies down, and the other stands guard. Then they change spots. One time, I was trying to put the bit in my 4 year old's mouth. For some reason, he was being stubborn. So I massaged his gums on the bars, to get him to open his mouth. The next thing I knew, his eyes shut, and he seemed to fall asleep, leaning backwards. He had the halter around his neck, and I freaked thinking he might hit the end of that and panic. He didn't. His baby brain remained asleep and I quickly got the halter undone, promising myself I would never massage his gums again. I even had to holler at him a little to get him to wake up! Great post! Not sure why I find horse sleep patterns so fascinating--maybe because horses sleep so differently from other "pets".